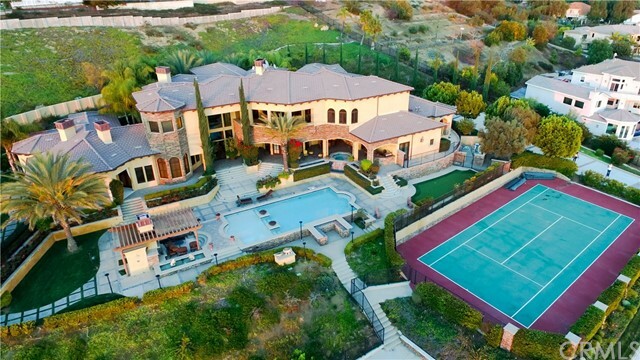 One in a lifetime opportunity to purchase an original style tuscan estate in orange county. Extremely rare parcel sits atop a sprawling 5 acres with breathtaking 360 degree views of gorgeous city lights, the catalina islands, as well as disneyland’s majestic fireworks display. Lush grounds feature towering palm trees and exotic greenery planted in strategic locations. Custom iron gates opens up to private driveway. Interior displays opulent one-of-kind design including custom floors, wrought iron railings, and made-to-order mill-work thru-out. Grand chef’s full granite kitchen with altitudinous 30’ barrel ceilings, exquisite custom built cabinetry, complete with top of the line appliances. Executive office/library suite with fireplace and partitioned additional office. Main floor master suite features a private deck, personal gym and retreat. Master bath boasts dual wet and dry sauna and automatic fireplace. Other amenities include state-of-the-art 10 seat home theater, billiard and poker parlor enters onto private deck with views. Luxury salt water pool includes swim-up bar and baja shelf low end. Outdoor covered kitchen and living areas near pool equipped with built in bbq, refrigerator, 1. 5 bath with shower and regulation tennis court. Use of the finest materials and masterful design evident thru-out palatial home that includes liberal use of marble, granite, travertine and distressed wood. Welcome to this amazing home in one of yorba linda's most prestigious neighborhoods, the gated manor house at kerrigan ranch. Offering nearly one acre of flat and usable land along with 7,500 square feet of highly-appointed living space, this home boasts entertaining options both inside and out. It has five bedrooms, six full and two-half bathrooms, a family room, formal living and dining rooms plus a bar and office downstairs and a loft upstairs. This home is designed for family and entertainment! The huge gourmet kitchen boasts custom made cabinets and granite counters. Directly off the kitchen there is a casual dining area along with a prep area which includes another built-in refrigerator. The expansive master suite has dual walk-in closets and every single closet in the home includes custom made wood organizers. The backyard has a large covered patio perfect for entertainment, bbq island, over-sized pool with waterfall and large grass area. The detached casita is approximately 800 square feet and is currently being used as a gym and game room but is also perfect for extended family or guests. There is garage space for four cars as well as a plenty of space for rv parking behind your own private gates. This home is in close proximity to yorba linda high school along with the new yorba linda town center offering shopping and dining options. Gorgeous single story luxury house located in the exclusive gated development of manor house at kerrigan ranch. This entertainers dream home offering 5 over-sized bedrooms and 6. 5 elegant bathrooms. Step into elegance as you’re greeted with a beautiful formal living and dining room with hand-scraped distressed wood flooring inlayed with limestone along with a soaring wood beam vaulted ceiling. Custom, temperature controlled 800-bottle wine cellar has plenty of room for you to store your wine collection. Gourmet chef's kitchen with viking professional appliances, cesar stone & granite counters and an oversized center island. Breakfast dining area opens up to the spacious family room which offers built in entertainment center and custom made fireplace. Master suite with built-ins, sitting area & a romantic fireplace. The massive backyard offers views to the ocean and includes resort like amenities such as a waterfall jacuzzi tub into the pool, relaxing fireplace and fire pit, cabana, outdoor bbq island with sit-up bar and a full bathroom. Four car fully finished garage with tankless water heater, central vac, security system and plenty of room for rv parking. Owner spent about $200k remodeled kitchen, all bathrooms, flooring, etc. Last year. This home offering the ultimate in privacy and resort living in one of the finest neighborhoods in upscale yorba linda. If you are looking for a home with amazing panoramic city light views on a large piece of land, best schools (high school rating 10) all located in a very safe community, then this home has all the features that you dream of! This classic luxurious home is located in the prestigious community of mount san antonio. Features include high cathedral ceiling looking down to the beautiful wide open entrance hall with a curved staircases adorned with wrought iron, main floor private office and a wet bar. This incredible property also includes a large family room highly upgraded with an extension perfect for a pool table, piano or play area with french doors exiting to the backyard patio and pool area. The gourmet kitchen features an over sized marble counter top, stainless steel appliances including built in refrigerator, 2 dishwashers, 2 ovens, microwave and a $3000 coffee maker. The master suite is extremely spacious with 2 extra areas: one rest area with fireplace and exercise room or nursery. The master bath is luxuriously upgraded and comes with double walk in closets. Must see to truly appreciate all this home has to offer! Two houses one lot a little over an acre. Located in the heart of yorba linda. This ranch style home sits on over an acre with another single family home in the back of the property. You own the easement. Main house 2802 sq. Ft. 5 bedrooms 3 bath,110 ft. From the street to the front door, meticulously manicured and landscaped. New circular driveway with pavers and a 4 tiered fountain. Oil rubbed hardwood flooring in entry, dining, and kitchen. The kitchen features quartz countertops, black appliances, double ovens, built in refrigerator. Newer windows throughout, rock fireplace in dining room. Central heating and ac 3 climate zones, plus a whole house fan. You enter the backyard to a lower level entertainment area with lynx bbq, warming drawer, small refrigerator, huge tile eating bar area with bar stools. Huge infinity pool/spa with a 28 ft. Water wall, surround sound, (640 sq. Ft. Pool house) features kitchenette and bathroom with walk in shower. Gorgeous bbq area with another huge tile bar, stools, tv, to host your family guests plus additional parking at the poolside entrance. Behind the pool area is the second single family home featuring 2 bedrooms, 2 bathrooms(1200 sq. Ft. ) 2 car attached garage, rv parking and hook-ups many possibilities for this property, rental, extended families. $200,000 reduced! Prestigious estate with fantastic city light views! 6 bedrooms and 6. 5 bathrooms. 5425 sqft. , 3-car garage. Impressive entry featuring travertine floors with medallion, soaring ceilings, and a grand staircase. Views can be enjoyed from the living room, the formal family room which opens to the chefs kitchen featuring top of the line stainless steel appliances, custom painted cabinetry, granite countertops and large island. Wood floor throughout the house. Dual master bedrooms on each floor, downstairs 2 guest bedrooms with its own bathroom. Upstairs an open loft leads 3 large bedrooms with their own bathrooms. Professionally designed landscaping with bbq, salt water pool, and spa. The neighborhood is conveniently located just a few miles from the 55, 57, and 91 freeways, disneyland, the brea mall, the mountains and the beach. Top-rated placentia/yorba linda unified school district, including lakeview elementary, a california distinguished school. No mello roos, low property taxes, and hoa fees. Back on the market, better hurry before it is gone again! 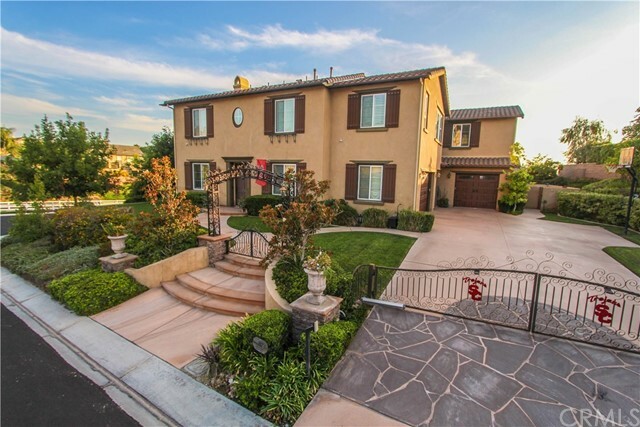 Stunning curb appeal and located in yorba linda’s most prestigious and desirable neighborhood - kerrigan ranch! Like a priceless rembrandt, your new home is painted against a backdrop of rolling hills and enjoys panoramic lighted views across orange county, to the glossy shimmer of the pacific, and catalina. This 6 bedroom, 5½ bath estate exudes luxury throughout. The private half acre lot has only 1 single story neighbor, offering the utmost in desirability. One bed and bath is located on the main level, along with an office, formal living and dining rooms, a music room or den, and the most amazing gourmet kitchen that lives up to “master chef” standards. Take note of stunning custom crown and double crown molding. Upstairs, the master suite enjoys unobstructed views, dual huge walk-in closets, and a redesigned master bath that would rival a spa at any 5 star resort. Discover the bonus room, up the stairs, off the kitchen that currently accommodates a theater and game room. This home is perfect for entertaining. The breathtaking backyard is unbelievable. Salt water pool, spa, dual gazebos; one complete with tv and fireplace. The outdoor kitchen surpasses most homes indoor kitchen and even has its own wine refrigerator! Don’t miss the new insulated garage doors complete with wifi app, electric gated driveway entry, video camera surveillance retrievable on you phone, and paid solar panels (bills of $600-800 per yr). Stunning entry with large sweeping wrought iron staircase near a private office. Formal living and dining rooms with wood (eco-friendly bamboo) floors with a fireplace. An enormous great room, including kitchen, family room and breakfast nook with a view of city lights and the garden and pool area. The kitchen has a large island with granite counter tops stainless steel appliances and a walk-in pantry. There are five bedrooms, one private suite is on the first floor. Upstairs there are 4 more bedrooms all with separate bathrooms, a extra large loft / bonus room, and a study. The master suit has a separate retreat which could be used as a office, nursery or exercise room. There is a balcony with an amazing view. There is a lg. Jetted tub and separate shower, his and hers sinks and organized walk-in closets and plantation shutters. The back yard landscaping and pool are stunning! Amazing views, so much room an extra private corner lot. There is a covered outdoor dining room next to a outdoor kitchen including a double island, sink, bbq, ice bin, extra burner, and an space for a keg. Take a splash in the pool and spa. Relax in front of the outdoor fireplace with a city light view and the sounds of the waterfall. Excellent yorba linda high school and travis ranch schools with are all rated 10. Nestled in the majestic hills of yorba linda this impeccable kerrigan ranch estate provides a tranquil sanctuary for rejuvenation and entertainment alike. Boasting resort-like grounds and set against a lush hillside backdrop, discover the ultimate in luxurious living! Elegantly appointed with designer touches throughout including crown moldings, custom paint finishes, hardwood and travertine flooring, and finely crafted built-in cabinetry. This premier floor plan features a grand living room with fireplace & luminous picture window, elegant dining room with intricate mural & butlers pantry with wine refrigerator, executive office, convenient main floor en-suite bedroom, and large loft/teen room. Expansive family room opens to the breakfast nook and chefs kitchen with stainless steel appliances and immense work island. Retreat to the spacious master suite featuring a dual-sided fireplace, reading nook & marble-infused bath boasting a soaking tub, large shower, and two walk-in closets with organizers. French doors open to the serene central courtyard with chiseled-edge travertine and intimate conversation area with fireplace. Entertaining is effortless in the gorgeous rear yard featuring an exquisite saltwater pool with dramatic deck jets, spa with cascading water feature, gazebo, 5-hole putting green and expansive bbq island. 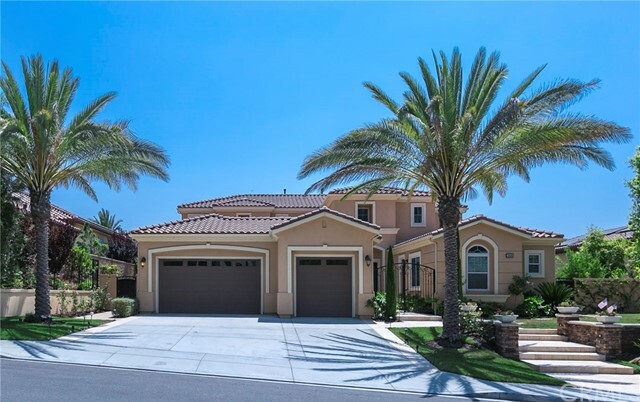 Complete with garaging for 4 vehicles and just blocks to the new yorba linda high school in an award winning school district, this home truly has it all! Luxurious custom single-level estate nestled in ½ acre land of a highly cherished neighborhood. This finest crafted/upgraded estate awaits you. Entering the beautiful wrought iron double-doors graces you an exquisite view of the rotunda foyer, wine room, office, living room, & formal dining. It is architected tastefully w/ vaulted ceilings, columns, custom cabinetry, wonderful light fixtures, recessed lighting, sensational built-in speakers, & fireplaces! The great room & kitchen present built-in cabinets/shelves/desk/counters, vast marble top center island, and elegant breakfast nook. Top of the line appliances include wide double-door sub-zero frig. /freezer, wolf 6-burner,char broiler, griddle and ovens, double-drawer dishwasher, etc. Hardwood flooring in main area, travertine & marble in entry way, bathrooms, & inside laundry room, carpet in bedrooms. The bright grand master suite features a retreat, 2 double-doors to backyard, spa-like bath w/ double-vanities. The other 3 en-suite bedrooms are large, each has its own bath, & walk-in closet w/ built-ins. The professionally-landscaped backyard boasts a large viking bbq island, rock waterfall with spa, enchanted rock river, gazebo, exercise/yoga platform, vegetable garden, mini-orchard w/ various fruit trees. 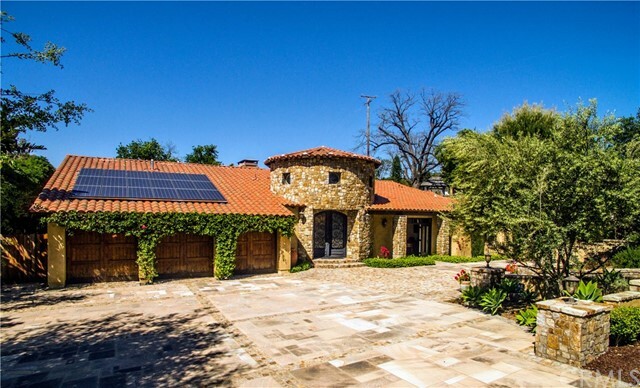 The paid off solar-energy system & drought-resistant landscape offer a green living lifestyle. Awarding winning schools, quiet/private street, close to the historic downtown, & the new exciting yl town center. As of today, 4/23/2019 the average home price for homes for sale in Yorba Linda is $1,331,000.